Digital and technology developments are fundamentally transforming the luxury retail industry. 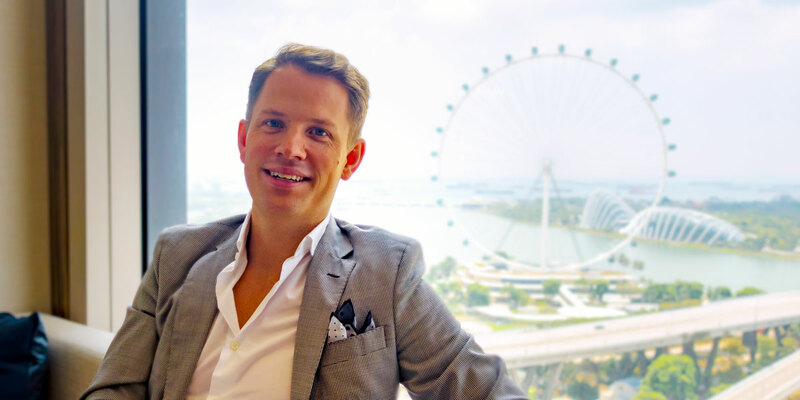 The direct-to-consumer (DTC) e-commerce model, in particular, is increasingly reshaping the luxury shopping landscape by making it easier for new entrants to gain market shares. The playing field is rapidly changing for traditional luxury brands. In parallel, affluent consumers’ expectations are also evolving. Luxury customers expect their online interactions with a brand to match their first class offline experience. Customers have no patience for faulty filters and continuous scanning through irrelevant items to find THE product they are looking for. Luxury shoppers want a seamless and personalised shopping experience. That is particularly the case with Millennials and Gen Z consumers who often start their brand discovery experience online. It’s the same generations of young, affluent consumers that are driving 85 per cent of the global luxury sales growth and now represent over 30 per cent of all luxury spending. Luxury brands are gradually acknowledging the new reality around them: their customers expect their flawless in-store experience to be replicated online. 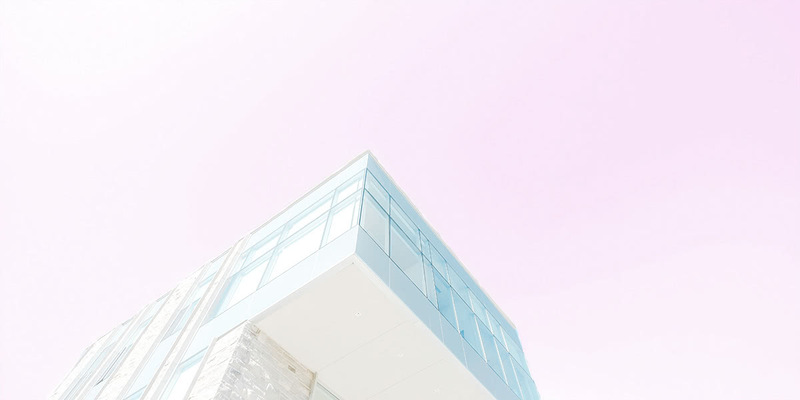 This radical generational shift is pushing high-end brands to experiment with connective technologies such as artificial intelligence (AI). 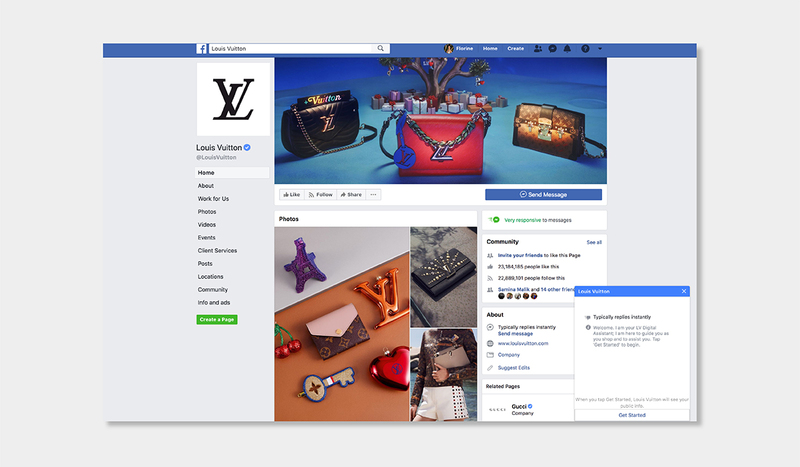 To cater to consumers’ changing tastes, luxury brands are increasing their presence online and testing some level of AI integration into their digital platforms. Gartner predicts that 85% of customer interactions will be managed by artificial intelligence by 2020 and estimates global artificial intelligence business value to reach $3.9 trillion in 2022. AI-powered personalisation is set to become one of the fundamental driving forces reshaping luxury e-commerce in 2019 and the years to come. However, the opportunity comes with its fair share of challenges, particularly around user privacy. Analysing a large amount of data can do wonders for online retailers. 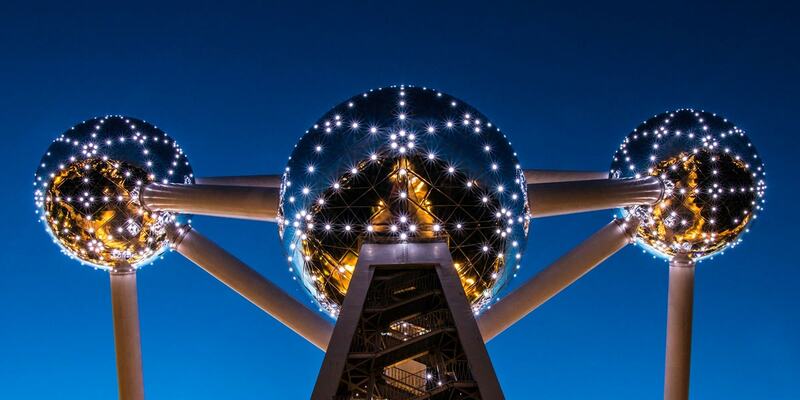 We’ve seen before how big data is a golden opportunity for luxury brands. Most luxury brands have a wealth of information available on their consumers’ behavioural habits which can be collected and processed to acquire, up-sell and cross-sell loyal customers. Making sense of all the available data by producing actionable insights is the real challenge, however. As a result, some premium brands are now experimenting with artificial intelligence technologies to generate and manage a large amount of information about their users and deliver timely and personalised recommendations. The luxury marketers’ online toolbox now includes more insights about who their customers are and what they might care about at a particular moment. Artificial intelligence enables brands to better leverage consumer data (such as individual shopper’s profile, browsing history, abandoned carts, purchases and returns) to promote the right products at the perfect time on the ideal channel. Brands have to tread very carefully when collecting and processing their consumers’ personal data, however. Users are often unaware of or unclear about what exactly is being collected and how it’s being used and cases of privacy violations are, unfortunately, legion. Luxury brands must be transparent about how they will use personal data and ensure that their use would only be opt-in. The disclosure of how businesses are using that data and the way to communicate it are, unfortunately, still a big question mark for many brands. But the companies who have the vision and capabilities to generate valuable insights from their customers while respecting their privacy will win over the long run. Artificial intelligence is paving the way to a more personalised online retail experience. Direct human input won’t be required to accompany consumers at every step of their purchase journey thanks to advanced tools. Chatbots are messaging robots designed to converse and interact with humans. Chatbots enhanced with artificial intelligence can provide extra support to brands’ customer service strategy. If salespeople are an essential part of a luxury brand marketing strategy, AI-powered chatbots are beginning to manage parts of the customer service experience in a cheaper and more efficient manner. Basic chatbots functionalities (such as order status updates, product comparisons, stock availability) are becoming commonplace on e-commerce websites. Chatbots can answer questions day and night, but also instantly record valuable customer information, understand behaviour patterns and make real-time decisions. Some luxury brands such as Louis Vuitton, Burberry, Tommy Hilfiger, Dior and Estée Lauder have already implemented their own chatbots. When applied to the luxury retail industry, however, the inclusion of chatbots must be adopted subtly to preserve the service quality that affluent consumers are accustomed to. 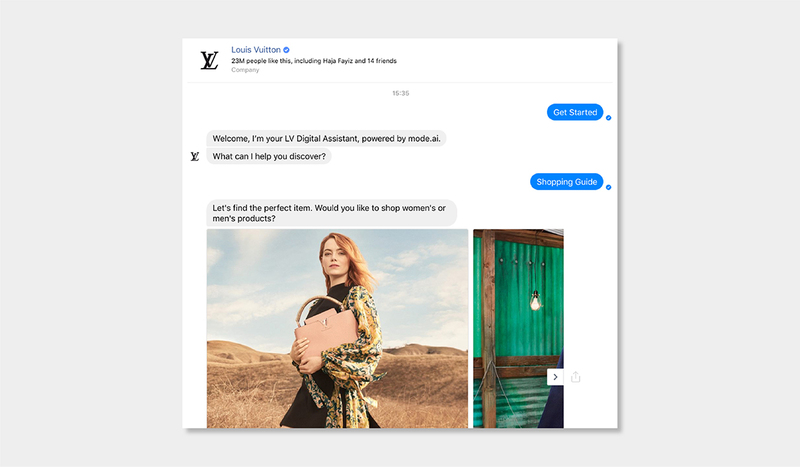 LV Digital Assistant chatbot leverages AI technology to give customers a more “sophisticated, personalised, visual and conversational online shopping experience for each client” via Facebook, where Louis Vuitton counts more than 23 million followers. Powered by mode.ai, the chatbot addresses a wide range of questions, can suggest an ideal item from the brand’s online product catalogue, provide users with more information about the world of LV and help with logistical concerns (such as product care instructions and store locations). The chatbot also allows users to share products with Facebook friends and get votes on what to buy. By implementing Natural Language Processing (NLP) into chatbots, businesses can connect with customers at scale and in a way that resembles natural language. Dior, for example, uses emojis and GIFs to create a more personal and convivial conversation. A subset of Artificial Intelligence, Machine Learning is essentially about feeding data to machines and letting them learn by themselves to make accurate predictions. Machine learning improves automatically through experience. By making sense of real-time customer data, Machine Learning can help luxury brands offer highly personalised and relevant recommendations to each individual shopper. Beauty brand L’Occitane in partnership with Qubit, implemented an AI-powered personalised experience on mobile. 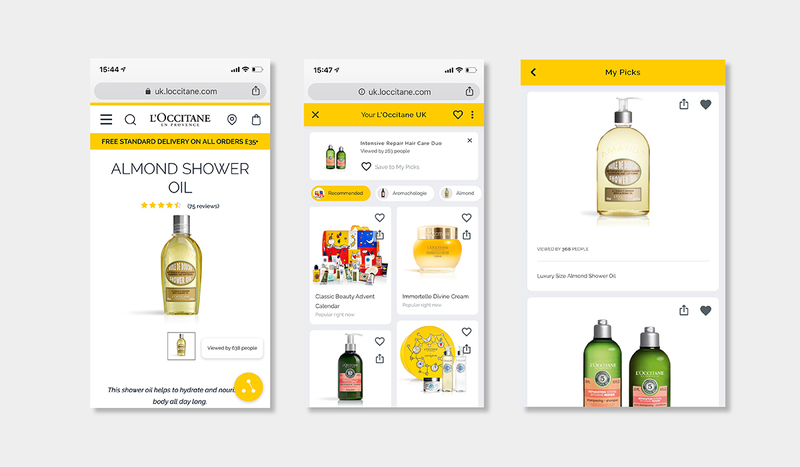 Combining machine learning and customer behaviour data, L’Occitane showcases different products to each user based on their behaviour on the site. Using a format similar to the popular social media feed experience, L’Occitane delivers a tailored online experience. After browsing for a few minutes, a “New suggestions for you” speech bubble pops up. By clicking on the icon, users access a feed of individual product cards which shoppers can select to view more details, share via email or social media, or save items to their “Picks”. Images are powerful engagement tools. Humans process pictures 60,000 times faster than text. Image recognition refers to technologies that identify and detect an item or attribute in images. With advances in artificial intelligence, the accuracy of image recognition has significantly improved the past few years. This opens the door to new applications for luxury brands. AI-enabled facial recognition is changing the face of online luxury retail. For affluent consumers who opt to allow images of their face to be captured in order to benefit from a more personalised experience, reassurances that those images wouldn’t be used for any other purpose is essential to building trust. Powered by Modiface AI technology, Sephora’s online Visual Artist allows potential customers to upload a photo of themselves to “try on” makeup and experience how various products would look like on them. 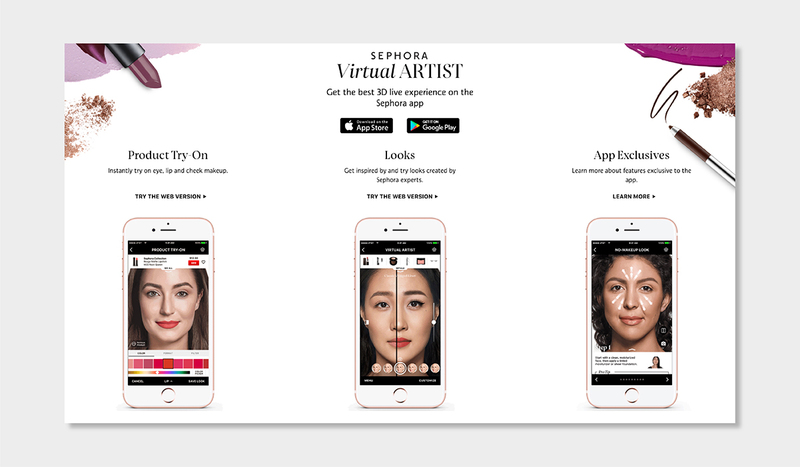 The app maps the unique facial features of each user and lets users virtually apply various makeup combinations (with no mess) which are integrated into Sephora’s inventory. The selected products can then seamlessly be purchased via mobile. The Sephora app is further enhanced with video tutorials and offers personalised recommendations (such as suggested shades based on the customer’s skin tone) in real-time. Visual Search is a technology that uses AI to allow users to search for products by simply uploading pictures of an item that catches their eye – be it in a magazine, on social media, or a passerby. A visual search engine can identify items in an image and find identical or similar items across a brand’s catalogue. No more time-consuming keyword searches (Think of the frustrating times you didn’t know how to describe with words what you want precisely) and endless scrolling. Users can now upload an image and are automatically shown similar items from retailers’ inventories. Tapping into the growing influence of Instagram and mobile commerce to reach young affluent consumers, Visual Search is becoming an increasingly valuable discovery option for online luxury retailers. Using Visual Search technology developed by Slyce, American luxury department store Neiman Marcus launched their “Snap. Find. Shop.” mobile app that enables shoppers to upload photos of objects they like in the real world to find similar products in the Neiman Marcus catalogue. Users can then easily purchase their preferred items via the app. Similarly, Farfetch is embracing Visual Search with its “See it, Snap it, Shop it.” mobile app feature that lets shoppers upload pictures from anywhere to find a specific product or similar options. Users can select their own photos but also Instagram or Pinterest posts. 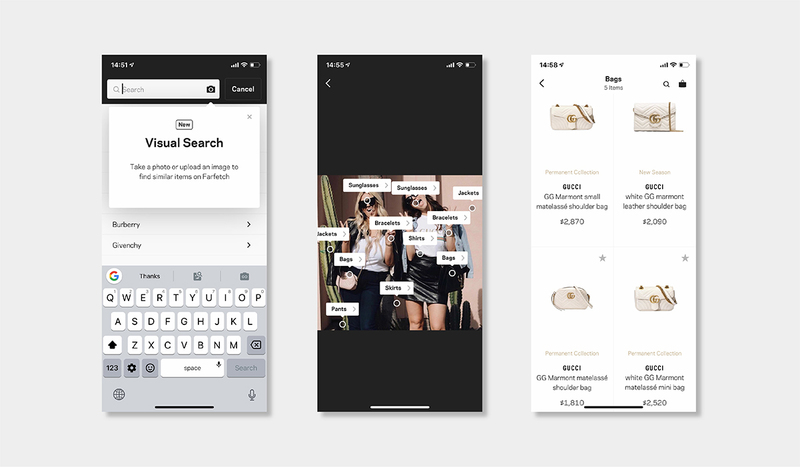 By partnering with AI startup Syte to develop this in-app visual search feature, Farfetch hopes to improve discovery and inspire their customers to shop on their e-commerce platform. Voice Search uses AI to allow shoppers to search for items using speech. comScore predicts that voice searches will account for 50 per cent of all web searches by 2020. Conversational artificial intelligence enables customers to interact with luxury brands in ways that are convenient and highly personalised. While voice technology and natural language recognition in AI are still evolving technologies, they are hinting at a transition towards voice-assisted shopping. Starbucks launched its ‘My Starbucks Barista’ mobile app feature that uses AI to enable customers to place orders using voice command or messaging while suggesting them their personal favourites. By leveraging artificial intelligence-powered voice, Starbucks aims at offering a more personalised customer experience. Artificial intelligence is set to be a game changer in luxury retail. Opportunities for integrating AI into luxury e-commerce are seemingly endless. There is indeed scope for AI to be used for personalisation at all stages of the customer journey, from discovery to checkout. To remain relevant, luxury brands must invest in technologies that enhance their customers’ experience. But AI-powered technologies can be intimidating for some luxury retailers and one should not be distracted by the overwhelming hype surrounding Artificial Intelligence. AI is still very much in its infancy. We are just scratching the surface of what the technology can deliver and significant improvements remain to be done in order to anticipate online shoppers’ needs and desires before they even crystalise them in their own minds. However, AI brings us closer to relevance at scale. By leveraging artificial intelligence today, luxury retailers can already deliver an online customer experience that is more personalised to each customer while preserving their brand integrity. The online luxury retailers who are starting to embrace the right AI application for their business have seen sales growth and increased customer loyalty. But in a context of increased privacy regulations and consumers’ concern about how brands collect, store, and sell their private data, luxury brands have to be thoughtful and considered about their use of AI technologies. The CIO’s Guide to Artificial Intelligence, by Kasey Panetta, Smarter With Gartner, January 2, 2018. Three Ways Artificial Intelligence Can Enhance Your Personalization Strategy, by Alex Knapp, Forbes, April 17, 2018. Just say it: The future of search is voice and personal digital assistants, by Christi Olson, Campaign, April 25, 2016. Context is Everything, Adobe, 2018, Adobe, 2018. How AI boosts industry profits and innovation, Accenture.